Kashmiri Kahwah is a green tea served at religious functions, weddings even festivals. 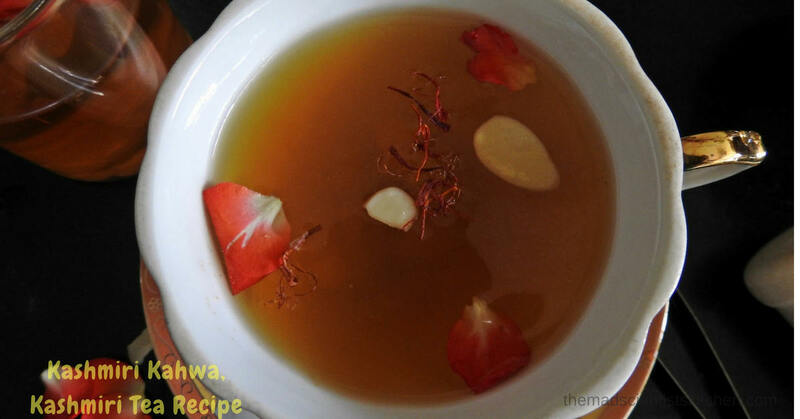 Qehwa, khewa is an aromatic tea with spices, a classic warming drink. Kahwah traditionally served in Afghanistan, northern Pakistan, some regions of Central Asia and, in northern India, especially in Kashmir Valley. It is a popular post breakfast beverage among Kashmiris. Kahwah also qehwa, kehwa or kahwa is a green tea boiled in water with saffron strands, dalchini/cinnamon, green elichi/cardamom, laung/cloves. Some recipes also add dried fruits such as cherries, apples, raisins, pine nuts, pistachios, walnuts, almonds, cashew nuts, dried apricots or dates. 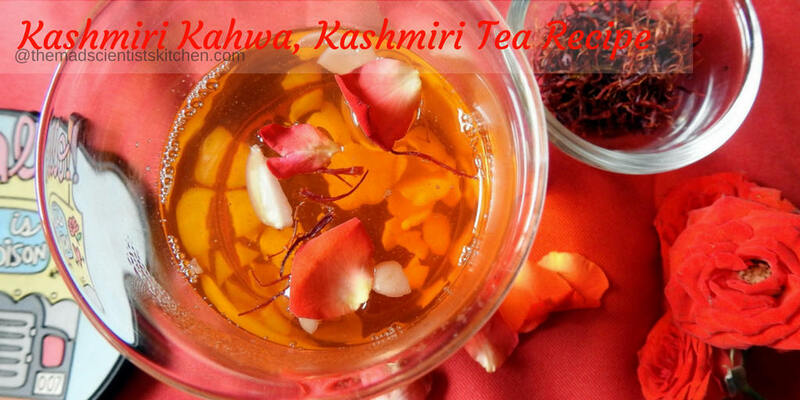 Kashmiri roses enhance the aroma of qehwa. Sweeten your Kahwah with sugar or honey and serve with crushed nuts, usually almonds or walnuts. You can add milk to Kahwa but then in Kashmir milk is added to serve the elderly or sick. Kahwah is traditionally made in a copper kettle called samovar and is served in tiny, shallow cups. However, in modern times kahwah is made in normal pans and vessels. Like I have already said you can serve Kahwah as part of a celebration dinner, after Wazwan and elaborate family dinners but then do not forget to add kong (saffron) as kong is added for special visitors. In the North Malabar region, India, Kahwah is usually served after lunch. 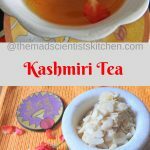 I had planned to make kahwah for ages now, but the thought of buying the Kashmir tea leaves and adding more tea to my bursting at the seams pantry was a big no-no. 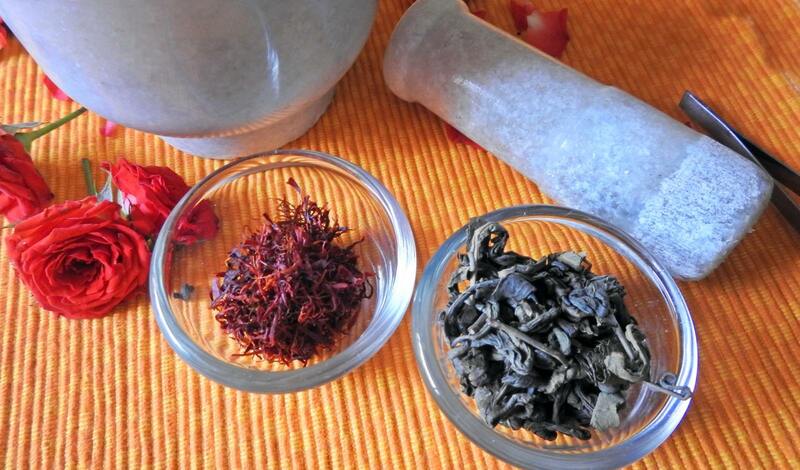 With a sigh of relief, I read you can make Kashmiri Kahwah with any tea leaves! Like all Indian dishes, you can add or reduce any of the ingredients used only be ready to imbibe new flavours. I must tell you that I have really got around making Kahwah when I was researching Kashmiri Recipes for Shhhh Secretly Cooking( thanks to Jayashree , my partner) in fact if my Kashmiri Pulao was not up to the mark I was to post Kahwah! The other Kashmiri cuisine Vegetarian of course you can chek here Nadru Monje/ Lotus Stem Fritters~Indian State Jammu and Kashmir, Kashmiri Dum Aloo! 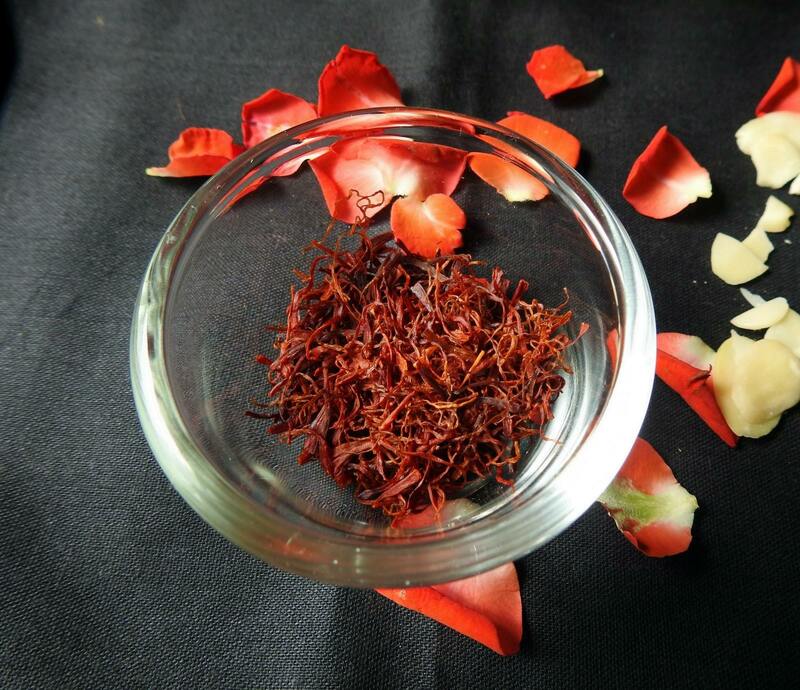 The soothing khawah below is ideal for those rainy days; the mild aroma of the spices and the colour of saffron is so very invigorating. Boil 1 cup of water along with cardamom, cloves and cinnamon. Add green tea leaves and switch off the flame. Let it infuse for about 2-3 minutes. In the meantime, add the almond slivers and the saffron in a cup. Strain the tea into the cup. Sweeten with honey and enjoy immediately. 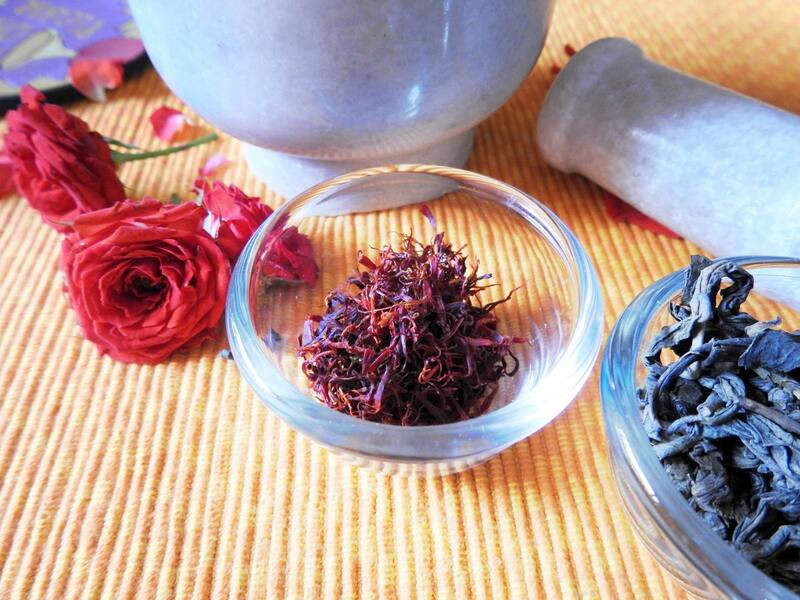 Qejwa, khewa is an aromatic tea with spices, a classic warming drink. I, once had kahwa at a wedding and really liked it’s taste. This kahwa with all the flavorful ingredients must have tasted the same. Do try and let me know if it is the same Ritu. Thanks in advance. What an interesting share, Archana! Your photos are very inviting! This is so flavourful.. I just love it. I was looking for this tea recipe for such a long time, it’s very difficult to find such authentic recipes, thanks a ton for the share, bookarked it. Can imagine all the amazing and exotic flavors in this Kashmiri tea!! So good! 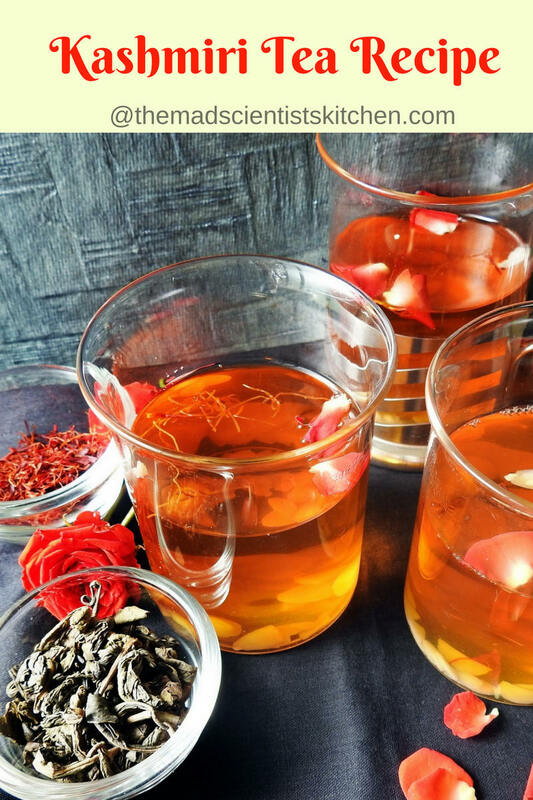 Lovely write-up di…the Kashmiri Kahwa is a flavorful beverage and yours looks so inviting ! How fabulous this Kashmiri kahwah looks, what an attractive colour, am yet to try this beauty.. Well done Archana. 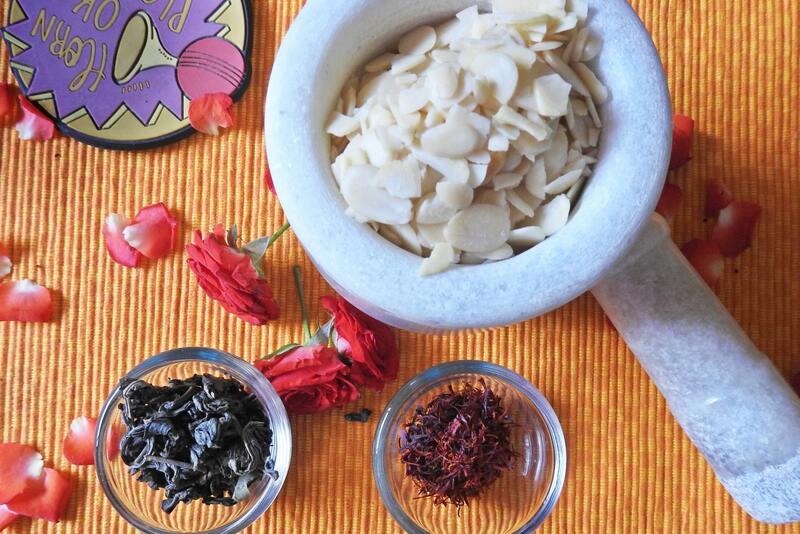 Such a unique, aromatic and colourful tea, I’ve only tried once this tea. Bookmarking your recipe. Do try Lathiya. It is an amazingly delicious. I make it almost every night but without saffron. So warm and comforting drink. 😀 Will taste great anyway. very well explained this kahwah. I bookmarked it. Surely it will be aromatic with saffron and spices. Loving it. Such robust flavours and simply love the colours. 🙂 Am bookmarking this archana. Will try soon.